Data bars can display from left to right (the default), or - as here - right to left. Remember - you can only use these if you enable the preview table and matrix visuals. Here I right-clicked in the numerical Sales field. 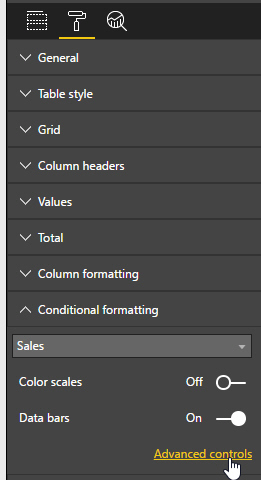 You can turn data bars on in the Conditional formatting section of the Format toolbar. 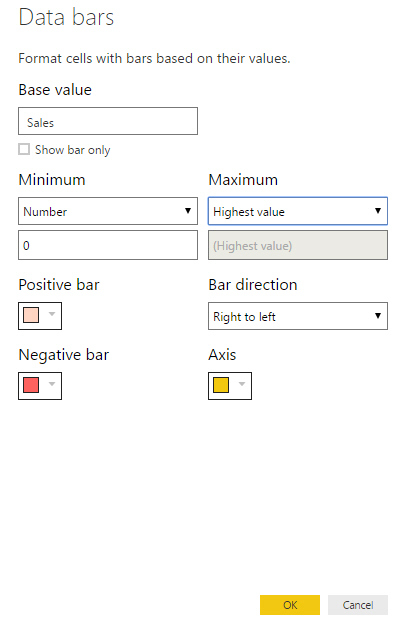 Note that you have to click on the Advanced controls link to format data bars (Microsoft obviously decided this toolbar is getting too cluttered). 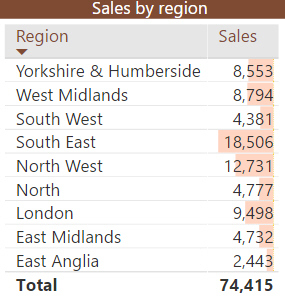 Here I've set the minimum amount to be 0, rather than the minimum sales value, and I've changed the default colour scheme. I suspect Microsoft will add to this dialog box over the coming months.